Kilbarron Castle is a medieval castle and the birthplace of Mícheál Ó Cléirigh [the chief author of the famous Annals of the Four Masters], located near Ballyshannon in the south of County Donegal. 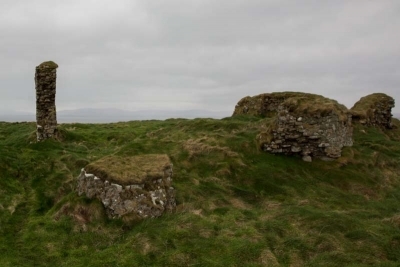 The ruins of the castle are currently in a very precarious condition, and the Kilbarron Castle Conservation Group applied to be part of Adopt a Monument Ireland to help to protect, conserve and interpret the remains of the site. 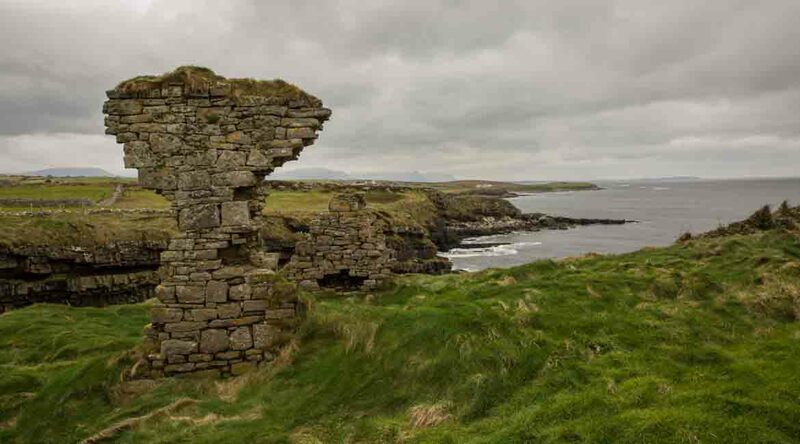 Located on the coast of County Donegal, the site is a late-medieval fortified tower house that has important links to the O’Donnells, who were rulers of Tir Conaill (Donegal). 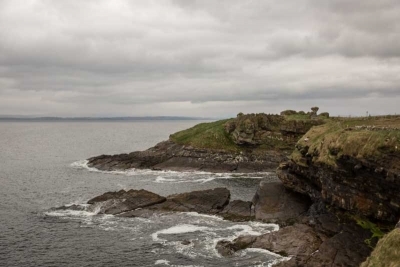 The castle was originally constructed some time around the twelfth century, but after it was demolished at the end of the fourteenth century, it was reconstructed by the O’Clery family, who were ollamh or court poets and historians for the O’Donnells. 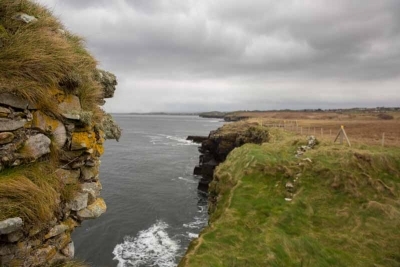 The family established a renowned bardic school focused on poetry, literature and chronicles, and this became an important place of Gaelic culture and learning. Perhaps the most famous scion of the family was Mícheál Ó Cléirigh who was one of the chief authors of the famous Annals of the Four Masters. Today the ruins of the castle are in a precarious condition and one of the chief aims of the community is to ensure the conservation of the remaining fragments of stonework that still survive. Kilbarron Castle Conservation Group was formed in October 2014 to endeavour to conserve the ruins. The committee has twelve members across a broad spectrum of skills who have carried out community work and projects such as the Creevy & District Community Development Co-Operative Society, and the enormously popular Mícheál Ó Cléirigh Summer School. With support from The Heritage Council the group have successfully commissioned and completed a Conservation Report, and a Topographical Report to gain a better sense of the archaeology. To keep up with the latest news, please follow the Kilbarron Castle Conservation Group on Facebook. Please Help to Share the Story of Kilbarron Castle, Choose Your Platform!